St. Saviour H.S., Park Slope, is in the midst of celebrating its 100th anniversary as a Catholic institution for young women of the Diocese of Brooklyn. For the better part of those 100 years, sports have been an integral part of the school’s history. Even before girls played sports regularly in this country, the Pandas were ahead of their time. 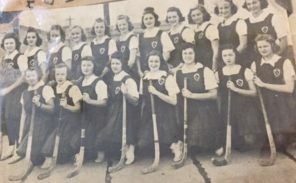 Photos in the school’s archives show sports teams from as early as 1935, which predate the school’s first-ever yearbook in 1939. Some highlights from the early years include undefeated seasons in field hockey in 1938 and basketball in 1958-1959. Girls’ sports were formally recognized after the passing of the Educational Amendments of 1972, which included Title IX. Since then, St. Saviour has fielded teams in all girls’ sports offered by the GCHSAA – proudly displaying all of its trophies throughout the school. The Pandas have also had six 1,000-pt. 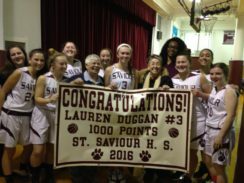 scorers in basketball: Anucha Browne, ’81; Karen Erving, ’87; Jenn Hamilton, ’89; Patrice Erving, ’91; Sue Radday, ’93; and Lauren Duggan, ’17, who was the only one to accomplish the feat as a junior. The school’s athletic alumnae remain in touch with their alma mater and genuinely appreciate their sports experiences, especially those who played before Title IX. Here’s to another 100 years of St. Saviour sports.